Photos by Mike Munroe (right), Tristan Blaine (top left), and Angeleen Olson (bottom left, of a juvenile). 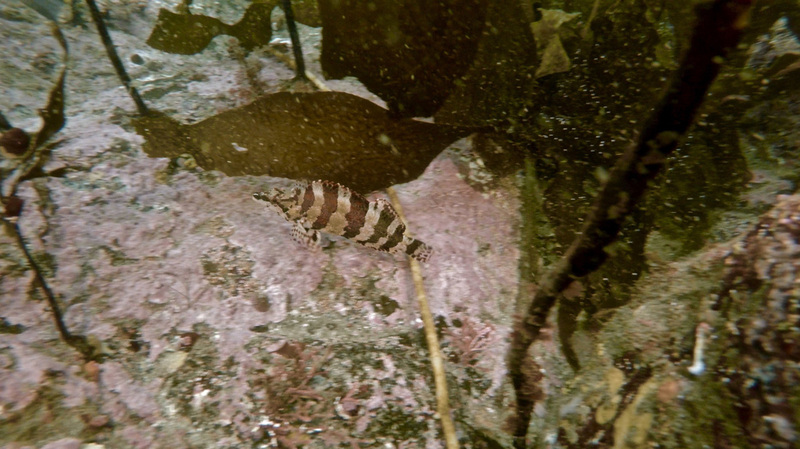 The painted greenling can be identified by its elongated head with a pointed snout, and large dark vertical bars (usually red) against a whitish body. This barring is obscured in darkened breeding males. The painted greenling has two pairs of bushy projections (cirri) near its eyes - one of the pairs looks like bushy eyebrows. 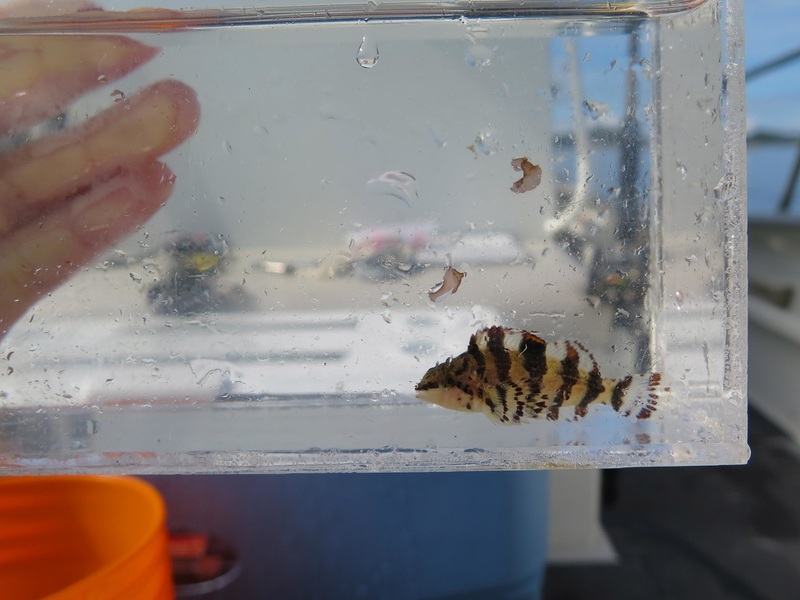 This distinctive fish gets to 25 cm long. 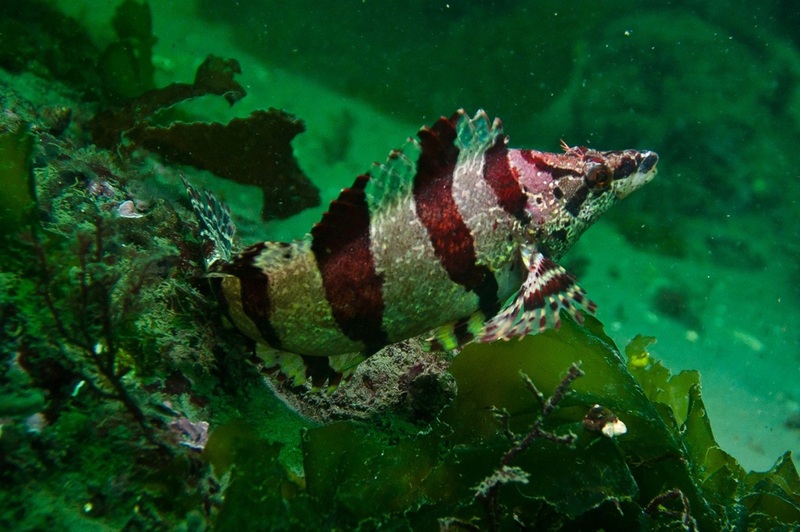 The painted greenling can be found in pairs or individually, hovering around rocky reefs in the intertidal and subtidal (to about 50 m) of protected shorelines. It may also be found around wharves and pilings. Individuals, especially juveniles, may be found resting at the base or on the oral disc of some anemone species, including the white-spotted anemone (Cribrinopsis albopunctatus) and the fish-eating anemone (Urticina piscivora). The painted greenling range extends from central Alaska to northern Mexico. Divers often find this species hovering but stationary - unless a cluster of its orange eggs are near by, in which case it may confront the intruder. The fish-eating anemone, which preys on fish as its name suggests, has been observed with the painted greenling lying protected on the anemone's oral disc; similarly, the painted greenling appears to be unharmed by the stinging tentacles of other anemones. Froese, R. and Reyes, R.B. Oxylebius pictus Gill, 1862 Painted greenling. FishBase. Accessed 19/12/2014. Harbo, R. M. (1999). Whelks to whales: Coastal marine life of the Pacific Northwest. Madeira Park, BC: Harbour Publishing. P. 222. Lamb, A. and Edgell, P. Coastal Fishes of the Pacific Northwest. Revised. (2010). Madeira Park, BC: Harbour Publishing. Pp. 196-197.